Austral Lock is a division of Gainsborough Hardware Industries. 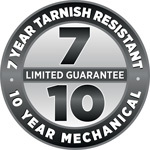 In addition to the guarantees under the Australian Consumer Law (‘ACL‘), Gainsborough provides consumers as defined under the ACL (‘you‘) an extended warranty that all products in its product range (‘Products‘) will be free from defects in materials and workmanship under normal use (‘Guarantee‘). If a Product fails to conform to this extended warranty during the applicable extended warranty period, Austral Lock will either replace any failed component of the Product or replace the Product free of charge (which Austral Lock will determine in its absolute discretion). Under this Guarantee, Gainsborough will either repair or replace any failed component of the Product or replace the Product free of charge (which Gainsborough will determine in its absolute discretion) subject to the following terms and conditions. Installation or maintenance of the Products not in accordance with the instructions provided with the Products. Products subject to alterations or repairs which were not approved of by Gainsborough in writing are not covered by this Guarantee. (For the avoidance of doubt, Products subjected to the attachment of accessories or use of non-genuine replacement parts other than those manufactured or approved by Gainsborough in writing are not covered). Costs incurred by the removal, replacement or installation of the Product are not covered by this Guarantee. Personal injury, property damage or economic loss, howsoever caused, will not be covered by this Guarantee. The Guarantee applies for the periods of time indicated on page AU4 (classified by Product series and in accordance with the guarantee symbol on the Products). (b) the costs of claiming this Guarantee including the cost of returning any defective parts is borne by you. If the costs of returning any defective parts are excessive or unreasonable, please contact Gainsborough on 13 14 18 so that we can arrange a collection (if considered appropriate in the circumstances). In addition to this Guarantee, certain legislation (including the ACL) gives you rights and remedies as a consumer under law which cannot be excluded, restricted or modified. This Guarantee must be read subject to such legislation and nothing in this Guarantee has the effect of excluding, restricting or modifying those rights. Payment in respect of the reduced value of the product. Our goods come with guarantees that cannot be excluded under the Australian Consumer Law. You are entitled to a replacement or refund for a major failure and for compensation for any other loss or damage. Int J Clin cost of diflucan in india Pract..